The Boys in the Band is known for being the “first gay play”. Obviously not the first by any stretch it was however the first commercially successful, and if you will ‘mainstream’ gay play. It also was one of few to reach that status before the AIDS epidemic hit, and changed the gay community, and theatre by and for the gay community for the following decades. Like ‘The Destiny of Me’ before it, this play was a most symbiotic addition to my trip. 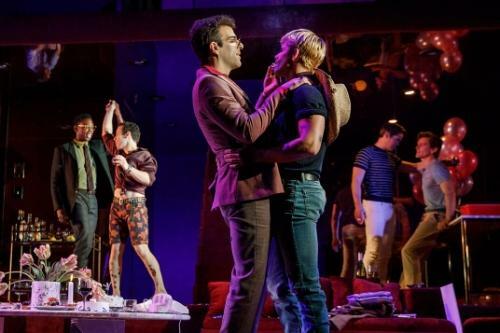 Having spent many years studying the use of theatre as a response to the AIDS crisis, seeing one of the few commercially and critically successful ‘gay plays’ to predate the crisis, and theatre that followed was very pertinent. Having traveled to see Angels in America, seeing a taste of gay theatre’s trajectory before it was also a fascinating accompaniment. The Boys in the Band was also staged in London last year, so it was with recent knowledge of a production that I went in. The play itself, as fittingly Tony Kushner writes in his introduction to the 40th Anniversary edition, is a first play and suffers many of the issue of a first play. It is still however comedic and moving, and a fascinating slice of early liberation life. Some comments on the play dismiss it as ‘dated’. It is no more dated than any historical piece. While Kushner’s play retains continued relevance on it’s political spectrum, it’s slice of life from the 80s may be viewed as just as dated. Both continue to be relevant. The fact the Crowley’s writing may make us uncomfortable with it’s attitudes to sexuality, gender and race is in of itself reason to see and consider the play. This production takes a darker tone to the London production, which was effervescent in its energy and enthusiasm but perhaps skirted around the darker tones of the play. That said there is a sense of perhaps overly worthiness to this that goes against the grain of Crowley’s writing at times. But overall the sense of taking comedy seriously and understanding the darkness that lies just beneath the surface really gets to the heart of the play. It is a play full of kitchy camp humour, but there’s a dangerous and dark undertone to it. As the company gathers for Harold’s birthday (“she likes to make an entrance” late in the piece) there’s campy barbs at one another, over the top dampness that while hilarious also acted when written as a means of owning gay identified. And in fact this remains the case today. Alongside the fun and frolics of the Birthday party, a number of serious sub plots are weaved. They are a group of men conflicted over themselves, and their relationships. From the potentially closeted former roommate who may actually be the most clear cut of characters, to the formally married man, to the man who desperately doesn’t like being a homosexual, to the man who embraces promiscuity. None are quite settled with the role they have given themselves, none are really able to admit to or address why. For an older play Crowley also addresses issues of race and difference. Yes, his Black character receives the kind of insults seen as intolerable today, but ‘of their time’ in the play, but Crowley addresses this. He’s also ahead of his time in addressing the issue of bodily perfection and ideals in the gay community- and the issue of those who fit outside them. Crowley is a shrewd observer of his world, and it’s worrying how even in the dated living room, much of this world is familiar. The cast is as talented as they are star- studded. 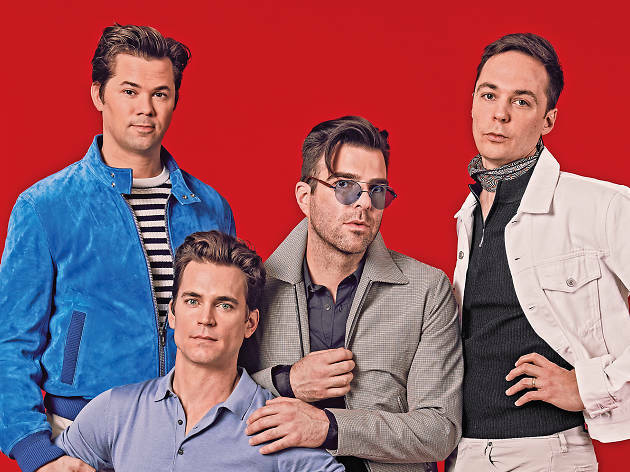 Jim Parsons continues to prove he is far more than his sitcom alter-ego, and brings shades of his Tommy from The Normal Heart to Michael, the party’s host. Next to him Matt Bomer as Donald gives an understated and powerful performance. A far quieter role in every respect to the others, but he does much with it, and the final moments in which the audience ‘sit with’ him, and director Joe Mantello gives character and audience a chance to reflect is a powerful one. A less affecting performance was Zarchary Quinto as Harold. The only performance in which I found myself comparing to London-where Mark Gatiss played the role- even without comparison however, Quinto’s interpretation didn’t quite land. While Harold is a character, by his own admission, playing a role of villain, performing and pushing buttons on Michael and the other friends, there was something too ‘Pantomime Villain’ in his performance. Too over the top to see what lies beneath. And too surface level to believe there was much more. Standing out perhaps against the nuanced performances others were giving, Harold really needs to have a chink in his own performative nature for the character to really land at the end, and with Quinto that just never quite clicked. 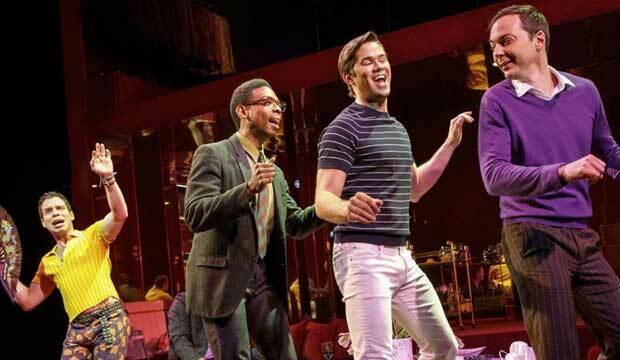 The entire cast offer strong performances, but the standout was Andrew Rannells. Proving what many musical theatre fans have known of his acting ability for years, he managed a nuanced and sensitive performance. Larry is a challenging character- easy to brush off as a shallow, attractive foil for others. 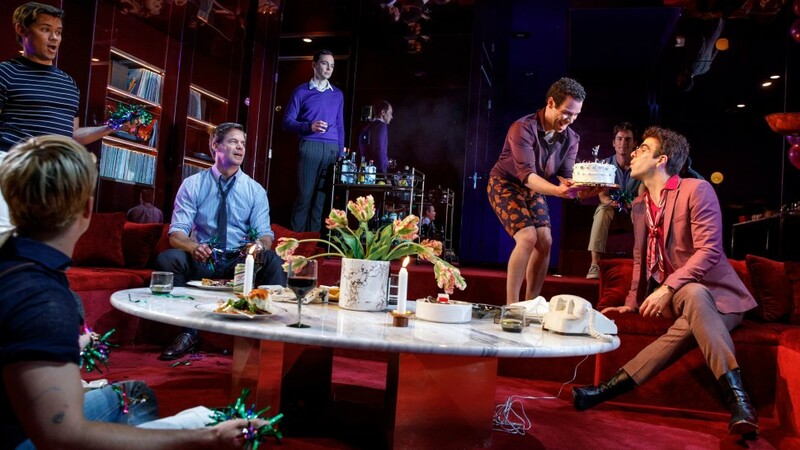 But there’s much heart to the character, and much to say about the gay community- torn between promiscuity and a clear love of his boyfriend Alan. There is a lot going on in the part, and Rannells brings a true sensativity to him, to the extent it is Alan and Larry’s relationship that really steals the narrative focus- something that actually Crowley may have intended, under the bitching and banter, there is this complicated and beautiful relationship happening. The complexity of the Larry/Alan relationship cuts to the heart of what Crowley wrote, and what Mantello pulls out in this darker production. On one level the gay community was screaming, partying and living free. On another they are trying to negotiate relationships with each other with no guidelines- do you continue to live subversively now liberation is coming? do you mimic heterosexual lifestyles? is there a middle ground? and what has this along with patriarchal culture done to the psyche of gay men? Some 40 years later, gay men still grapple with these issues. And while much has changed, little has changed. Gay life is still an endless set of negotiations, outings, and balancing public and private personas. It’s complicated and messy and there’s no prescribed answers. So while Crowley’s play has thankfully dated in many ways, it’s also cuttingly pertinent. Right down to the unraveling of or exposure of Michael’s mental health. That he is falling apart, in part due to who he is, and an inability to reconcile it, a lack of facility to discuss it, while the man who seems to love him feels he’s standing helplessly by. There’s much in that gay men today can recognise, there’s much in that anyone can recognize.